A look back on last night’s best NBA action. Golden State Warriors star Stephen Curry. 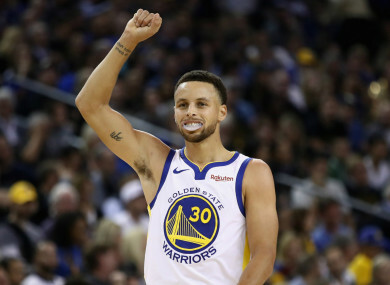 STEPH CURRY BECAME the fifth player in Golden State Warriors history to reach 15,000 career regular-season points after the NBA champions beat the Memphis Grizzlies. Curry joined Wilt Chamberlain, Rick Barry, Paul Arizin and Chris Mullin on Golden State’s list during Monday’s 110-93 victory. “It’s a really cool milestone, an unbelievable journey so far,” Curry said. The two-time MVP finished with 20 points and seven rebounds to help lead the Warriors in Oakland, while Kevin Durant posted 23 points to move 33rd on the all-time scoring list. Durant and Curry were two of five Warriors players to make double figures as the depth of the NBA champions proved too much for Memphis at Oakland’s Oracle Arena. Meanwhile in Houston, James Harden exploded for 47 points as the Rockets overpowered the Utah Jazz 102-97 to extend their winning streak to four games. Harden’s virtuoso display included six rebounds and five assists. Three other Houston players made double figures, with P.J. Tucker finishing with 16 points and Eric Gordon adding 12 points. But it was Harden’s eye-catching display that dominated the postgame discussion, with coach Mike D’Antoni leading the plaudits. Harden has averaged just over 38 points per game in his last five games. “This level, the last three or four games are as good as he ever played,” D’Antoni said. Elsewhere, the Milwaukee Bucks outlasted the Detroit Pistons 107-104 thanks to Giannis Antetokounmpo. Antetokounmpo and his supporting cast proved to be too hot to handle, despite a triple-double performance from Blake Griffin and an impressive fourth-quarter comeback by the Pistons. Detroit trailed by 15 at one point down the stretch, but they went on a huge run to cut the lead down to one with a little less than three minutes remaining in regulation. Antetokounmpo, however, demonstrated his vast skill set and led his team to the victory. Antetokounmpo recorded 32 points and 12 rebounds on 15-of-21 shooting, while Khris Middleton poured in 22 points to support Milwaukee’s superstar. Pistons star Griffin had 19 points, 10 rebounds and 11 assists in the losing effort, and Reggie Bullock posted a career-high 24 points. Email “History-making Curry and Durant lead Warriors while Harden sparkles with 47 points”. Feedback on “History-making Curry and Durant lead Warriors while Harden sparkles with 47 points”.